A photo of the June 19th, 1915 U.S.S. Arizona launch ceremony. 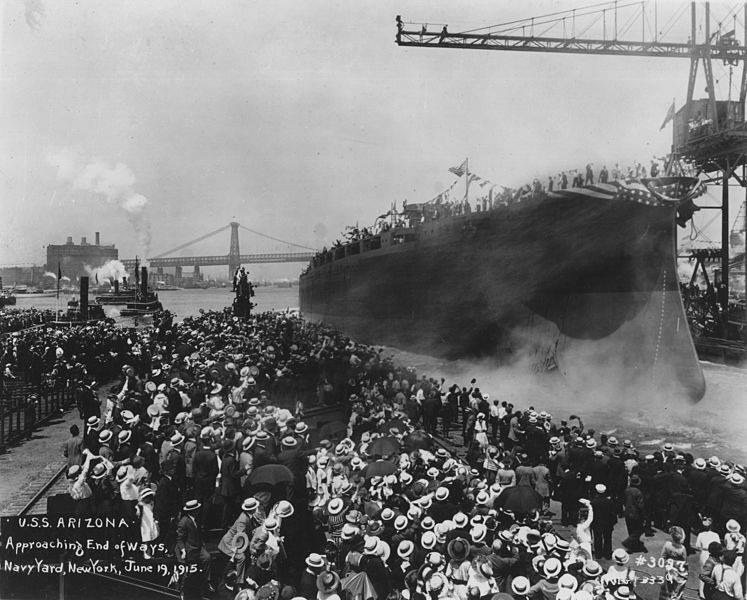 In addition to being christened with champagne, as is tradition, the ship launch ceremony also featured a bottle filled with water that had passed over the top of Roosevelt Dam, a structure that was then the pride of the state. Arizona Secretary of State Ken Bennett and other dignitaries dedicated Arizona’s newest memorial, the World War II Memorial at Wesley Bolin Plaza, earlier today. The monument features a fourteen-inch gun from the U.S.S. Arizona, which was sunk in a sneak attack on Pearl Harbor seventy-two years ago today. The Arizona is the iconic symbol of the December 7th, 1941 attack, as represented in photos and newsreels of the period and by the solemn 1962 memorial that sits above the ship’s sunken hull today. The gun now incorporated into the new memorial standing on the plaza across from the state capitol is available for display only because it had been removed for relining prior to the “date which will live in infamy,” thus saving it from destruction. The ship’s silver service is another item on display today due to its being removed from the vessel prior to that tragic Sunday in December of 1941. The silver set was gifted to the ship by the people of Arizona, the youngest state in the Union at the time of the battleship’s June 19th, 1915 christening. Manufactured by Reed & Barton of Taunton, Massachusetts, the elegant eighty-seven piece set featured depictions of saguaros, Gila monsters, and a Grand Canyon scene alongside more traditional nautical imagery such as mermaids, shells, and Neptune. Unique among Navy silver sets, several pieces of the U.S.S. Arizona silver collection were plated with copper in tribute of the metal’s importance to the state economy. Taken off the ship in January of 1941 as part of an effort to prepare for the likelihood of war, the silver service waited out the conflict in a Bremerton, Washington storage facility. After a relatively short period aboard the U.S.S. 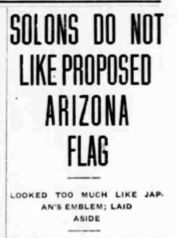 Tucson, the silver sat unused until Arizona Governor Howard Pyle lobbied the Navy to return the priceless set to the Grand Canyon State. The United States Navy granted Pyle’s request in 1953, returning the silver set bearing a seemingly incongruous mix of Sonoran Desert and nautical imagery to Arizona, where it can now be viewed at the Arizona State Capitol Museum. To view a collection of photos documenting the silver service, please visit http://azmemory.azlibrary.gov/cdm/search/collection/aslsilver.